The playbook for landscape photography is well documented: tight apertures, wide focal lengths, and clarity throughout the shot. We can’t control the light so we use filters to remove reflections and balance the exposure across the frame. Additionally, nature is a busy place so we try to eliminate distractions with different techniques, the most popular being long exposures. Take the above photo which ran around 3 minutes. Long exposures record a span of time and motion. However, given a long enough exposure the photo contains very little motion. Water is blurred to the consistency of glass and clouds streak across the frame taking on a painterly quality. 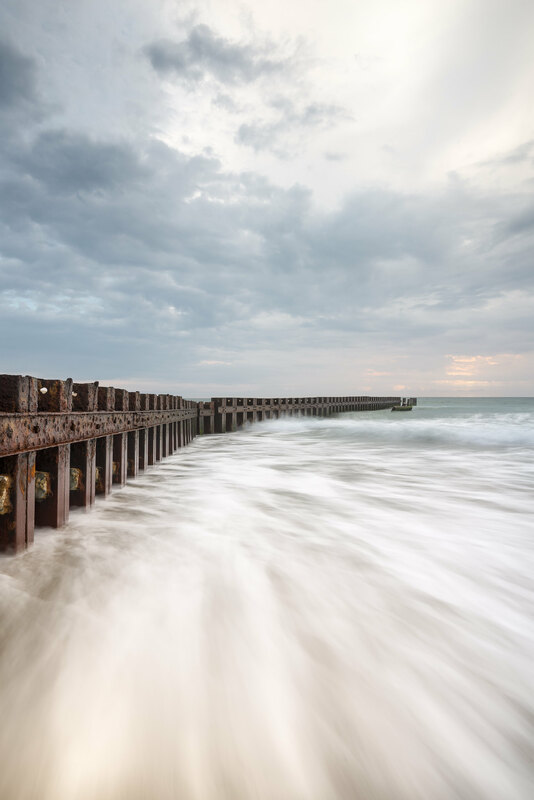 Long exposures are great for simplifying turbulent elements, but the resulting images can be a bit surreal. I want to give my landscapes a more natural feel versus this other-wordly effect that long exposures create. 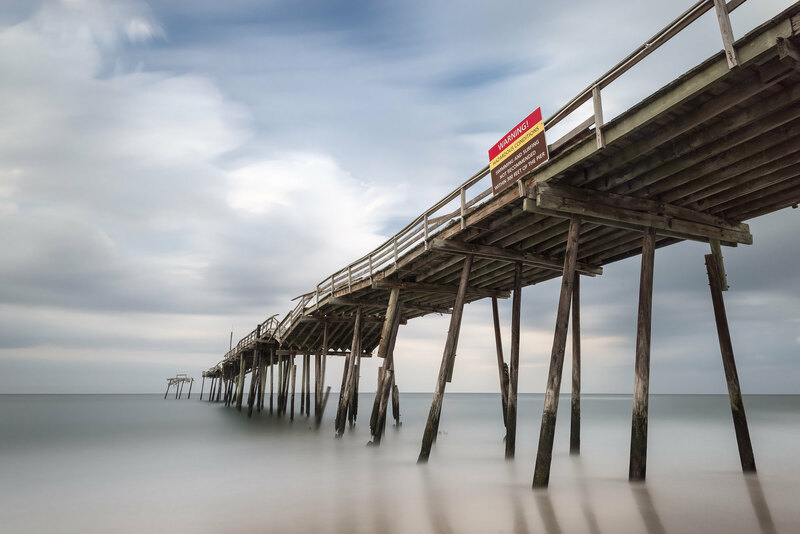 During a recent trip to the Outer Banks I tried two departures from my usual style, the first I’ll refer to as short exposures. 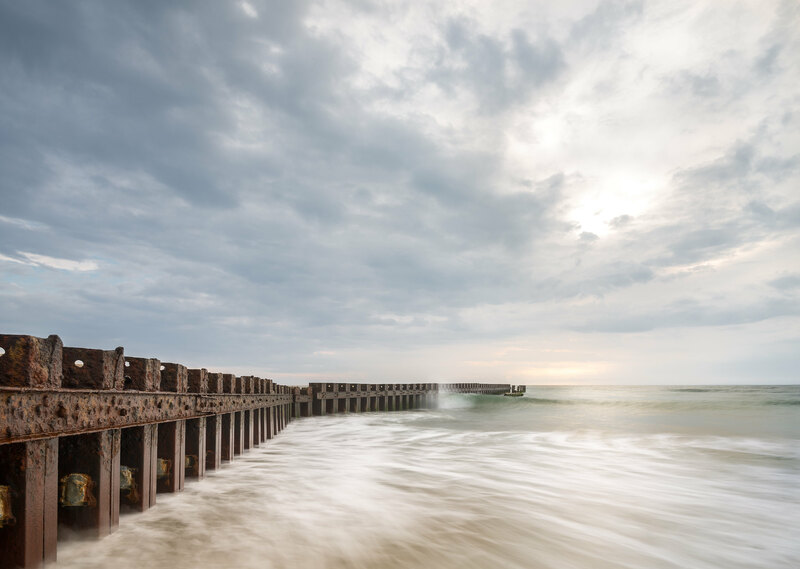 A “short exposure” is technically a long exposure but instead of blurring motion (around 1+ minutes) the shorter duration (1-4 seconds) is meant to emphasis motion. I was surprised by the variations in the resulting images. We can freeze waves with at 800/s or completely eliminate them with a 2 min exposure, but the 1-4 seconds range reveals a little world of unending differences. Is the water rushing in, or rushing out? Do you wait till a wave breaks, or wait until it’s flattened out? In fact the drawback of this style is the indecision I faced over which photos to keep and which to use in this post. With long exposures it’s easy to decide the winning photograph; proper exposure, sharpness, the right variation in the clouds. With short exposures not only do you look at these factors but you get to choose which example of motion fits the mood you want to convey. Do I want smooth lines which convey speed, or turbulent action which is far more chaotic? Which example of “motion” complements the other subjects in the shot? It’s similar to picking the right expression in a series of portraits. It’s also much easier to shoot-correct-shoot and see the different results, versus waiting 4 minutes only to find your exposure calculations were off by a full stop. Landscapes are typically shot in the 16-35mm range but these wider focal lengths distort the subjects. Most of the time this is done on purpose, foreground subjects are larger and subjects in the distance are compressed creating a strong sense of distance. This effect adds interest but still injects a bit of that surreal effect I mentioned before. Longer focal lengths are closer to our natural field of view, compressing the scene and adding a nice touch of depth of field. In addition, longer focal lengths can work where wider shots are just not possible. 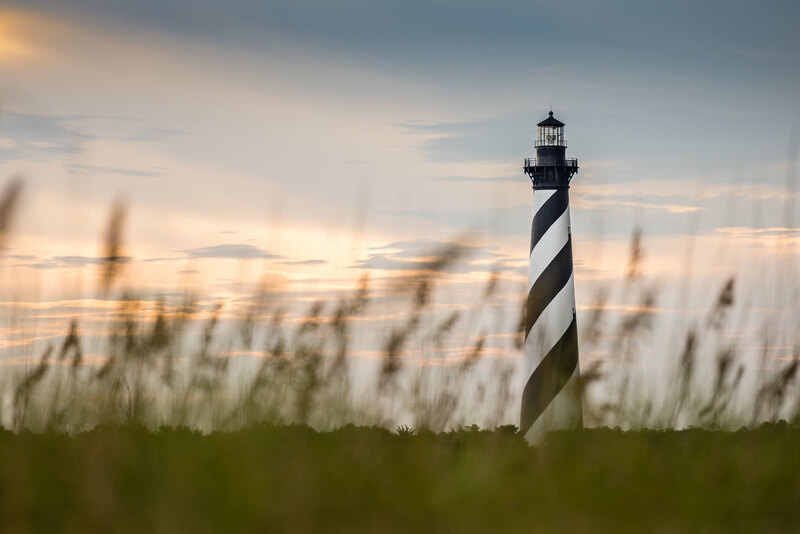 For example, the Hatteras Lighthouse shown above was shot at 200mm. The dunes create a nice horizon but they also mask a series of small buildings, trees, and a parking lot surrounding the lighthouse. I spent an entire morning up close with my 16-35 trying to find a shot that wasn’t there. Coming back from the beach I snapped off a few shots with my 70-200. I considered these test shots but I never made it back to the spot with a tripod. Luckily my hand holding discipline payed off and I was able to get a set of sharp shots with that natural field-of-view I was looking for. 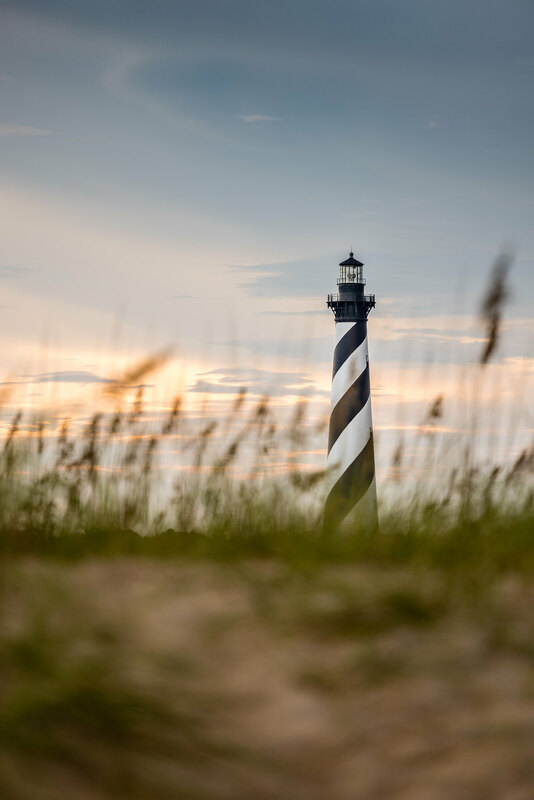 The dune grass creates a great foreground element and helps with the sense of distance. This summer didn’t produce the shots I expected so I went with all the usual excuses. Poor weather, poor subjects, didn’t bring the right gear, but the truth is my bag of tricks wasn’t working. I was looking for the same shots each time and I didn’t have the chops to work the situation. To add insult to injury, I was barked off a beach by a large sea lion during a recent trip to California, which spooked me about exploring remote locations. As you can imagine my confidence was pretty low. These new techniques, and a few successful shots, have given me that dose of inspiration and added to my arsenal. I’m a little closer to having a sense of purpose and expectation before an outing, rather than hoping that the sun, moon, and stars all align in my favor.